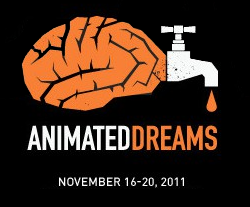 If I have any fans in Estonia, or if you happen to be passing by Talin, you can see Afraid of Falling at Animated Dreams Festival this week. For details on when the film is screening click here. They also included a clip of the film in their trailer for the Best International Student Animation category which was nice. For a chance to see it in the UK, the film is at Encounters International Film Festival this week in Bristol. See my blog post about Encounters here for more information. The film will be screening at the Arnolfini on Wednesday 16th at 18.00 and Friday 18th at 12.00. Click here for screening details on the Encounters website. I'm thrilled to announce that The Man Who Was Afraid of Falling has been shortlisted for the prestigious British Animation Awards 2012. Founded by Jayne Pilling in 1996, the awards have been running for fifteen years and showcase the work of the best talent in the country, new and old. Here's what the copy on the website says about the awards. We’re back - and busy preparing for the next British Animation Awards, which will take place March 15, 2012, at the BFI on the Southbank. The British Animation Awards is a totally unique event: the only one that brings together all the key players, and emerging and established talent, from the many and varied sectors of the UK animation scene, for an evening that is very different – and we think rather more fun! – than most Awards events. There is another stage of selection before the final award nomination but I'm really pleased simply to be shortlisted. You can read an article about the awards (albiet a fairly old one from 2004) on the BBC here.